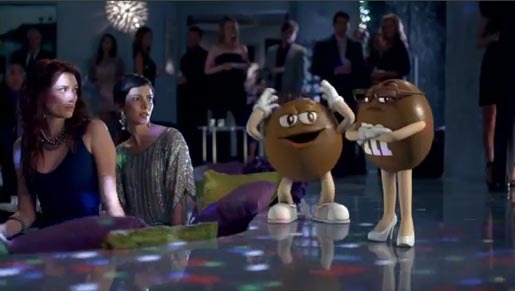 M&Ms has introduced Ms Brown to the world of advertising in “Just My Shell”, a commercial launched during the 2012 Super Bowl. 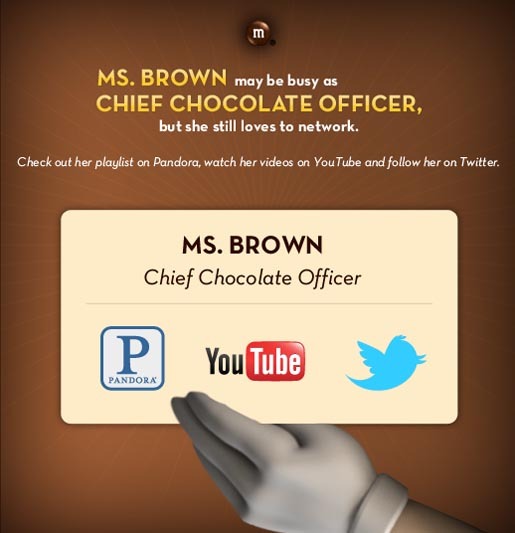 Ms Brown (voiced by Vanessa Williams) as Chief Chocolate Officer (CCO) has been working behind-the-scenes for the past seventy years, heling launch several new products and innovations in an effort to ensure M&M’S remain one of the best-selling milk chocolate candies in the world. She recently decided she could do even more good for the brand by stepping outside the executive office and serving as a public spokescandy, and chose the Super Bowl as the best place to make her presence known. 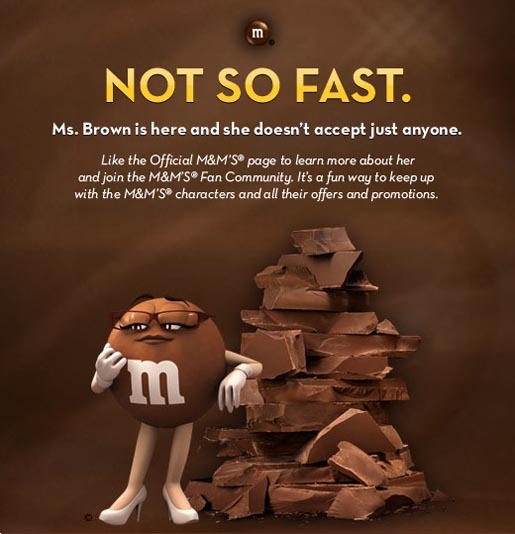 Ms. Brown will occupy the national spotlight throughout 2012 to showcase that M&M’S are not your average milk chocolate. She’ll be featured in a series of television, print and digital ads, in-store displays, promotions, as well as on Facebook and Twitter. The campaign includes a live chat with Ms Brown on the M&Ms Facebook page on Tuesday, February 7, 2012, starting at 11:00 a.m. ET at www.facebook.com/mms. M&M’S will open the Museum of Chocolate Art in New York City on Wednesday, February 8, 2012. The museum, which is located at 468 Broadway, will be free and open to the general public daily from 11:00 a.m. – 8:00 p.m. through Sunday, February 12, 2012. The museum features nearly 20 commissioned art pieces created with real milk chocolate that tell Ms. Brown’s life story. Fans unable to make it to New York City can see a virtual tour of the Museum of Chocolate Art at www.facebook.com/mms. Ms. Brown will make several cameo appearances during NBC’s Celebrity Apprentice beginning Sunday, February 19. 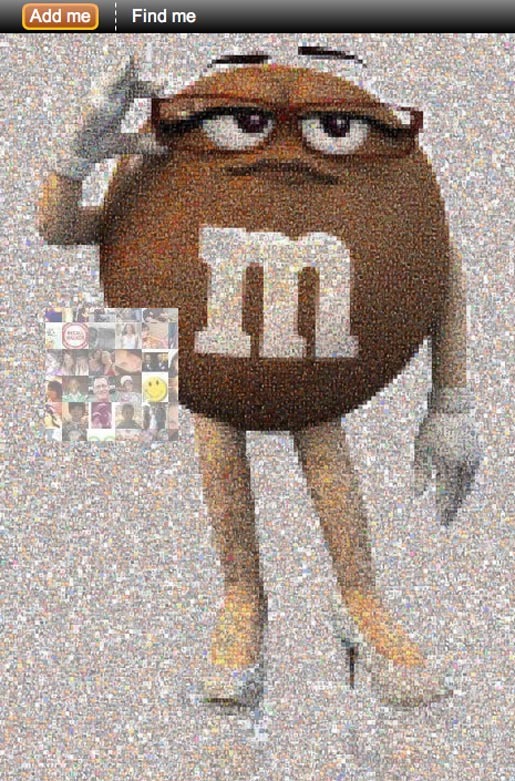 Fans are able to contribute their Facebook profile pic to a Ms Brown mosaic, and follow her on Twitter at @mmsbrown. The Just My Shell ad was developed at BBDO, New York.